They developed a system of text analysis that, applied to comments published in social media, is able to automatically detect complaints on noise pollution and classify them according to their origin. This system combines artificial intelligence (machine learning) with diverse techniques of language analysis. In addition, the system can predict the onset of noisy events, which can help city managers to design early interventions to avoid disturbances and health issues for citizens. The study has been developed in collaboration with Télécom Paristech. In Europe, it is estimated that 25 percent of the population is exposed to high noise levels, which can increase health risks. This causes public health issues and reduces quality of life, especially in urban areas associated with the lack of rest and stress.. Traditional surveys have been used to determine citizen perceptions of noisy urban environments, but these have the drawbacks of high cost derived from development and execution, a limited number of participants, and the duration of the surveying campaign. Additionally, this system is not agile when detecting problems or specific noisy events. In recent years, new systems of online citizen participation have come up and they allow interaction with local managers, but they are not generally used by the population. Users of social media post opinions and feelings about diverse topics: politics, TV, products, and of course, the environment, including noise pollution. Luis Gascó, a researcher from the group on Instrumentation and Applied Acoustics (I2A2) at UPM says, "For years, companies have been applying machine learning and natural language processing techniques to find out the opinion of clients about their products and services in social media in order to improve sales. However, this technological trend has not been applied in city management, missing social media posts which can provide real-time data about issues in a city." 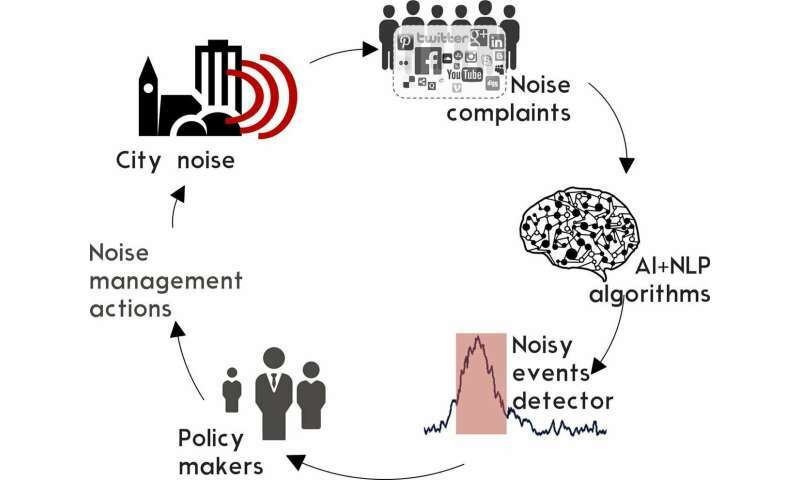 In this way, the project research team has developed a text analysis system which is able to automatically detect complaints on noise pollution and classify them according to their origin. To this end, they used the latest techniques in artificial intelligence, such as machine learning, and diverse techniques of language analysis. Additionally, researchers have designed a forecast system using statistical techniques that allow them to find out the appearance of a disturbing noise event from the number of complaints and specific words. The application of the system developed by UPM researchers is not only limited to the field of noise pollution. The researchers say it could be used to detect other types of problems, including damage to infrastructure and citizens' feelings about changes in urban planning like the semi-pedestrianization of Gran Vía in Madrid. Now, the researchers along with their French colleagues from Télécom ParisTech are searching for new partners, mainly companies of city management and transport infrastructure, to carry out a project of technological transfer to test this technology in vivo.